"Learning from Sylvie Gil and attending her workshop has been so much fun. I am so happy that I decided to attend her workshop. I was little apprehensive when I had first booked myself for this workshop, considering that I was a digital photographer and she shoots film. The moment you meet her you know that she can be a wonderful friend and a mentor. Sylvie had arranged for amazing florists, designers, stylists, makeup artist that made our photo shoot so chic and unique. Needless to say that I have comeback with some great images for my portfolio that has catapulted my business to a new level. Following her guidance, I have been able to double my price this season, and surprisingly have enough clients. I would highly recommend her workshop, and look forward to attending another session sometime soon"
"I was hesitant at first but let me tell you… This workshop is worth every penny you spend!!!!! Just the images alone that you bring back, which are going to set you apart from your competition, are a direct investment. Because of Sylvie’s workshop I was able to raise my prices 40% and most importantly choose my clients. I came back inspired and wanting to learn more. Because of her I decided to create a new mission statement, new marketing, new everything. Just talking about it makes me feel inspired all over again :) I have been to other workshops and Sylvie has a unique gift - she teaches! (and has impeccable style). You will find teachers that are amazing photographers but do not know how to pass that knowledge or are a little guarded with it. Sylvie is very generous and has an incredible eye for detail. " "Trip of a lifetime- her team was real, authentic, transparent, and most of all available. There were so many options for styling and shooting each day, and she gave us the freedom to explore our own creativity with a plethora of styling tools to achieve our own style, not just shooting something set in stone if that makes sense. Since the workshop (about 6 months), I have doubled my pricing (not just changing my pricing, but BOOKING 2/3 of next years weddings at the new pricing), and I am being featured 5x + the amount I was before - unbelievable, right. Sylvie Gil's team is the best, hands down." I have only amazing things to say! Sylvie, you're just so selfless and giving, the workshop was one of the best thing for me this year personally and business wise! "You gave me the confidence to go for it, and no one said no. I don't know how to thank you enough for that... I don't think that before the workshop I would have had the balls to do something this huge. Thank you from the bottom of my heart for the courage you and your workshop gave me. I'm going for it, all in!!" "Thanks, Sylvie. You are amazing and I cannot thank you enough for the workshop seat. I am so happy to know you!" Reflecting on this beautiful year and feeling incredibly grateful for how much my business has grown! Part of this rapid growth began when I took a leap of faith and attended the Sylvie Gil workshop in Burgundy, France. In short: my message to anyone who has always dreamt of making this industry your full time career but sometimes feeling like you're stuck or constantly doubting yourself. . . There is no reason not to follow your heart. Sylvie Gil Workshop and Paris is always a good idea! Your workshop was, absolutely the most rewarding creative experience of my life. It's no exaggeration to say it was life changing for me. You are amazing and put together an a tremendous event for us. I'll remember it forever. I'm tearing up again thinking about it. Wow! Just booked three more weddings for 2016 today. Feeling so happy and overwhelmed with joy. Attending the Sylvie Gil Workshops in France has been a complete game changer for me. This whole experience was so deep to me not just as an artist but learning to find my own voice. The workshop really pushed and motivated me to start taking my business to the next level. Sylvie, I just wanted to take a moment and let you know how truly grateful I am to have met you and been able to learn from you this year. You have changed the course of my life and opened my eyes to things I never could dream. Things will never be the same for me ―in the most wonderful of ways. Your workshop is something I will always remember and cherish and I have loved getting to know you and continue to learn from you since then. You are an amazingly kind, generous and talented lady and I am so grateful to know you. The creative team was beyond anything that I would have expected....not only did they source gorgeous pieces and details and create stunning vignettes, but they also took the time to meet with each of us and share their wisdom....and then of course we got to hang out with them each night and just have fun! I can't wait to hear the details for the next workshop! I loved getting to be around creatives again. I hate how isolating this job can be, when you work out of your home and by yourself. I LOVED getting to know EVERY SINGLE person at this workshop. It was such a blessing. My life is so much richer because I the genuine relationships I now have from our time together. Thank you for being classic and true, and for being REAL! You're such an inspiration. I not only admire your work but your fierce personality as well. It was the best shooting workshop I have ever been to — the pairs and stations worked amazing. I wouldn’t trade my experience at this workshop for anything. Truly once in a lifetime (well, I can only dream of returning next year) experience. The vulnerability, honesty, and encouragement from the team and the attendees was the best part of the workshop. It was a true authentic community, and I am so happy to be apart of it! The chateau was fantastic, the florals were amazing, the styling was fresh and innovative, and the teaching was practical and easy to apply to my current workflow. I would recommend the workshop to anyone considering it! The workshop was beyond anything I could have ever imagined or hoped it would be. It far surpassed any expectations that I had. I benefitted from the extensive networking opportunities as well as the breadth of knowledge provided by all of the vendors attending the workshop. I have attended workshops in the past but never had so much available to us, especially with such a willingness to uplift us through the process. The styled shoots were AMAZING! I could not be more thankful for the opportunity to work with such amazing stylists and other photographers during the experience. I loved how we had stations and were in smaller groups, rather than the usual 20 photographers all shooting the same thing at different angles. This part was by far one of the highlights for me. I learned from all your classes. I appreciated the knowledge that I gained and I loved that we had a well-rounded curriculum. I loved the relationships and opportunity to work with such talented professionals. This workshop was so much more than I anticipated. I've done a few workshops and none compare. The chateau was just insanely gorgeous....the food was delicious.....my wine glass was never empty. And then the actual shoots were just stunning....the models were beautiful and so nice. And then the creative team....wow. They were all so great...They were all amazingly talented but the plus side was just how incredibly personable, kind, and fun they were...Those are people that I could be friends with...not just work associates. I was really looking for the opportunity to really shoot with film. It was an area that I wasn't comfortable with and I this gave me the opportunity to practice this new medium. I was nervous while I waited on my scans...nervous that I completely messed up my exposures or focus. I was very excited once I got them back to see how lovely everything turned out.....so for me the biggest benefit was simply gaining confidence with film and trusting that I know what I'm doing. Normally with workshops I would complain that there are too many attendees.....groups are to large... or that I didn't have enough time with one particular setup. But the reality is that I think everything ran really smoothly. I felt like I had plenty of time with each setup. The creative team was beyond anything that I would have expected....not only did they source gorgeous pieces and details and create stunning vignettes, but they also took the time to meet with each of us and share their wisdom....and then of course we got to hang out with them each night and just have fun! And then of course the attendees themselves...I loved all of these people and I'm hoping that each and everyone come back for next year's workshop! And then there were the shoots.....Walking into that church literally took my breath away. Seriously, amazing!! Everything from the table cloths, to the invites, to the florals, to the dresses was beyond gorgeous. I've never had the opportunity to shoot details of this quality. Thank you again for everything! I can't wait to hear the details for the next workshop! Sylvie!I had the most amazing and unforgettable time at your workshop. It seriously was life changing for me. Thank you for being so generous and sharing your tips and suggestions. You are an amazing person and a talented photographer and role model. I am so privileged that I met you and I will always cherish those memories of the workshop in my heart. Sylvie, I just wanted to thank you properly for putting together such an inspiring workshop with such an amazing team! I miss it so much already! Thank you for your honesty and openness to teach us. 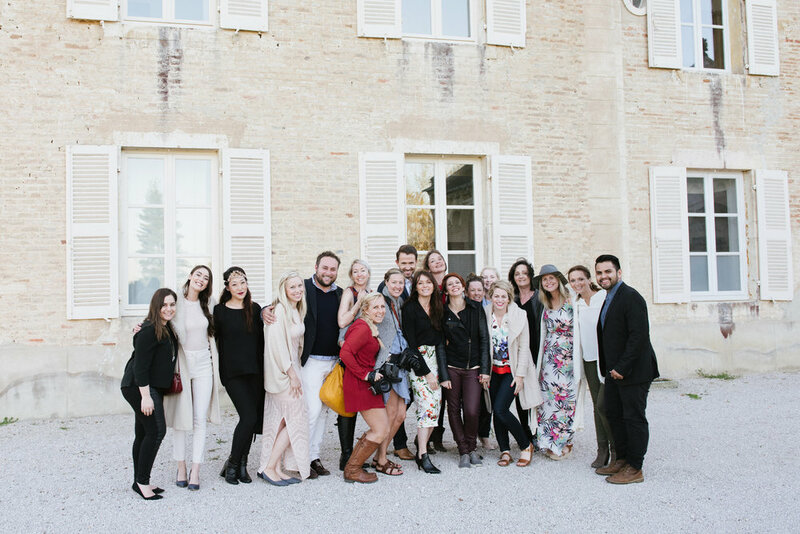 I felt so spoiled with the whole experience, the beauty of the Chateau, the kindness and talent of the vendors, and of course the delicious food! I hope we all cross paths some way somehow again in the future! It was an amazing experience. Everything was perfect and better than I imagined. The information I learned and feedback that I got is exactly what I needed for my photography. Sylvie was very generous in sharing her photography tips and was always glad to answer any questions and give feedback. The accommodations were amazing. The French food was incredible. The vendors were THE BEST! I was very pleased with every aspects of the workshop! I came away feeling very comfortable using my new contax camera (which I had never used) and with a better understanding of how to style different shots. I loved the opportunity to meet all the leaders! Each one was very down to earth and I felt, made everyone feel comfortable and like they fit in to the group. I love seeing that! I've been to workshops in the past where the photographer (leader) has been very cliquey with the attendees. I hate seeing that. So it was super refreshing to see the leaders take time to talk with every attendee! I loved meeting new amazing and talented people - workshop teachers/organizers as well as attendees. I believe these new friendships and relationships will be a priceless asset in the future - both on a personal and business level. There are so many additional ways I benefited (and will continue to benefit) from this workshop - as for example getting an insight from Brooke on the high end planner and styling end, learning more about SEO and social media but also learning from each other - seeing how fellow photographers approach certain situations and challenges or how they create their art. It is so inspiring being in a setting like this, where everyone brings a lot of positive energy and eagerness to learn and help. It is hard to sum this up into a few words - but I feel the experience as a whole really helped me grow. Your workshop has exceeded my expectations as i already told you but i’m telling you again as i like to repeat myself. I learnt a LOT from you and the attendees. It was a great opportunity to make some « Share and Reapply » and to have all the keys to be more efficient in my new business with a clear vision and defined strategy. What I loved most: - Your energy, your passion, your great experience and your beautiful smile ! I love smiles ! - My first step using Film with you (even if i have so much to learn !!!) - The great professionalism and the team spirit of your enthusiastic talented vendors (Brooke, Holly & Becky, Rose, Bianca and Marina, the Dream Team !) - The super gorgeous styled shoots with a lot of details- Really yummy meals cooked by a great chef ! Quality and quantity have been simply perfect. - Gorgeous castle/venue. Great idea to introduce the location by the owner of the venue (Aymeric) and then to have met Sonia who is very kind and friendly - The Welcome Gift and the personal Daily Gift each evening ! Very appreciated ! - Your transparency on your work (e.g : share your personal gear), even if you still have some little secrets ! - To have a new family and new friends who understand your passion ! :) - And last but not least : the macarooooooooons ! The workshop went beyond my expectations, I loved that you organized things to be spread out over the days so nothing felt rushed. I also loved the "retreat" feel to the workshop, it was lovely having everything under the same roof and being secluded with no distractions, and everyone was so warm and friendly it really made the experience worthwhile. All the extra added touches were amazing as well like the beautifully decorated dinners, the little gifts and surprises...Great job ladies!! As a beginner film photographer I wanted to really know how to integrate film back into weddings. And most important how to improve my brand and to get more solid knowledge on marketing. I think this topics were very well explained. The styled shoots were amazing, Jill and Max did a wonderful job! I was able to improve my own portfolio at the different styled shoots you provided. All the vendors were very well selected. Branding was a good theme that i benefit and take important lessons. listening to SMP lady was also positive, because we learn how to be better about submissions. It was a wonderful workshop and it was great meeting such talented people!